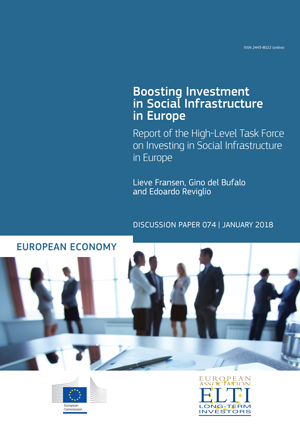 ELTI Association published a report on “Boosting Investment in Social Infrastructure in Europe”. This report presents the main findings of the High-Level Task-Force on Investing in Social Infrastructure (HLTF). Today the publication was announced at a dedicated event in Brussels to a large audience of stakeholders representing investors, governments and the social sector. Vice-President Jyrki Katainen represented the European Commission. Eugene Zhuchenko, Executive Director, LTIIA, has been a member of the HLTF, bringing the voice of private investors in infrastructure. Labelling. National and European institutions could grant labels to projects according to social efficiency criteria. These labels could facilitate identification and, in turn, the financing of these projects. Bundling. As most projects are small-scale projects, requiring a limited amount of investment, bringing them together could reduce the fixed costs and favour their dissemination. Blending. In the current state of the economy, financing for these projects cannot come from one single body. Mixing public and private financing and/or using social impact bonds, could facilitate the access of Social Infrastructure to financing, while maintaining their unique benefits for the community. Find out more about the proposals in the Press Release below and read here the full report.